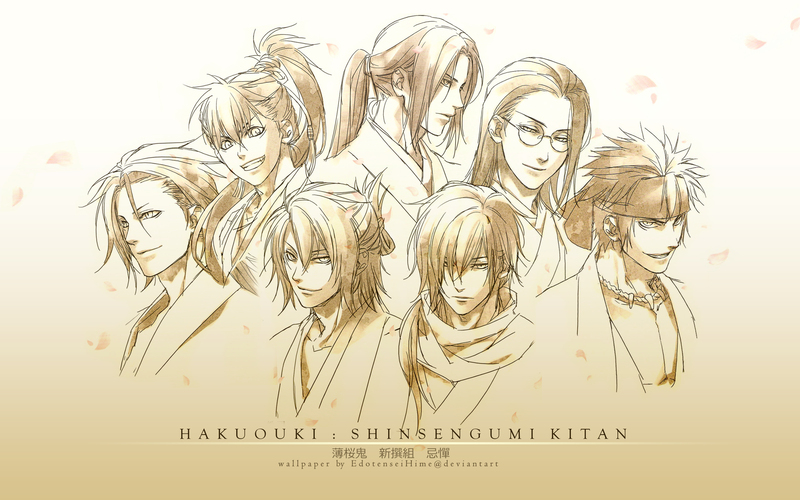 my first wallpaper of Hakuouki :-) teehee..
the making process already took hours and in the end, just before submit it, I just realize that I missed one important person: Kondo Isami-san -___-" errh..
Hi Mao! How are you doing? 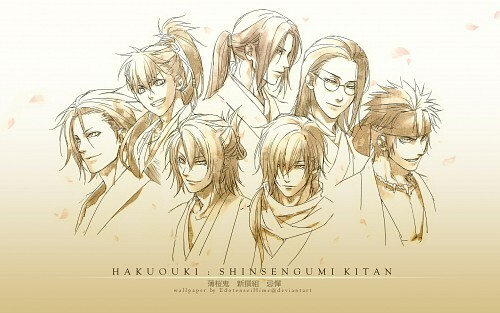 It looks like I'm not the only one to love the drawings from Hakuoki artbook! Nice job bending all of them! I LOVE THIS SO MUCH THE SIMPLICITY OF THE DESIGN IS JUST AND AWE FOR ME KEEP UP THE GREAT WORK! I really like it. I always loved the separate images of the guys, you put them together so perfectly. Great job! I love the concept of your wallpaper... It looks like one of these old-school movie posters, so simple and yet so effective. Thank you for sharing, it was a great idea to use those sketches together! wonderful! I love those guys ! Love the color you chose for this, it's perfect! There's something I absolutely adore about this wallpaper (it has that old painting feel to it). Probably the simplicity and elegance drew me to it. I find that it's not that complicated yet it strikes me as beautiful. Impeccable work! thank you so much..i so love them..